Order your Providence P203 6" Right Angle Patch Cable from AMS and enjoy Fast & Free Shipping. Get the Best Deal with our Lowest Price Guarantee & Great Customer Service! The Platinum Link series P203 model combines an NCS3 OFC conductor with a hybrid insulator consisting of NAP elastomer and special polyethylene materials. 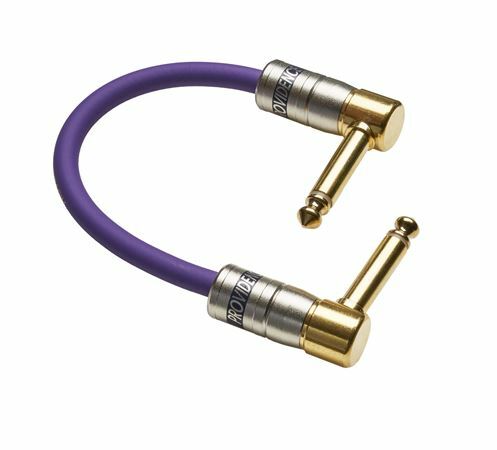 The application of innovative Providence technology throughout results in an outstanding blend of high sound quality and flexibility – characteristics that are rarely seen together in a single cable. Since the P203 was designed specifically for patching between effect units and between effect units and amplifiers, for example, sonic evaluation was carried out with 1-meter cable lengths rather than the longer samples used for standard cables. Unlike conventional patch cables, which are normally nothing more than short cables that can degrade frequency characteristics and result in a thin sound, the P203 model achieves excellent signal transmission accuracy and quality, and even helps to improve signal quality when used with compact effect pedals that can have a negative impact on the direct sound. Of course these same characteristics are also an advantage when patching between rack-mounted effects and preamplifiers. A convenient lineup of lengths from 0.1 meter to 0.5 meter is offered in 5 centimeter increments, so you can choose cables off the shelf for optimum patching with any rack or pedal-board system.